No wonder CRM selection committees consider User Experience (UX) as the most important parameter in selecting right CRM solution as it is proved repeatedly that a good user experience (UX) is the driving factor behind User Acceptance. User Acceptance is a key driver that differentiates a successful versus doomed CRM implementation. 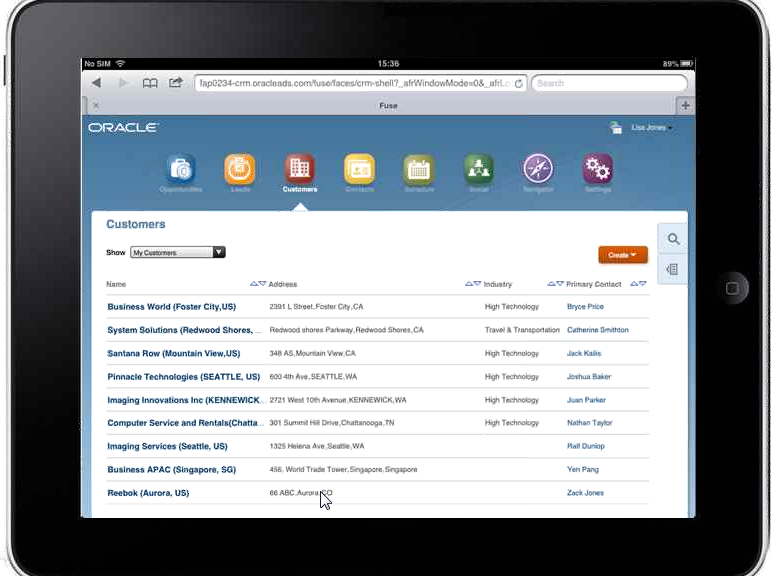 Here in this blog I would present some of the interesting UX features in Oracle Fusion CRM. The key UX challenge in designing the application for a “Sales Manager” is to organize all relevant information that is required for “Sales Manager” in one central location. Fusion CRM “Territory Management” module is one single location where a Sales Manager can effectively perform all his day to day operations. Sales territory management – In one centralized place, a sales manager can define the set of products / customers / geography that every sales person reporting to him is mandated to sell along with his Sales Quota. As this is a crucial activity for a sales manager to perform, the system provides certain interesting tools to make the sales manager’s life easier. If you are sales manager managing dozen of sales team members, the system provides flexibility to quickly check whether there are any Overlaps / Gaps on click of a button. Overlap basically helps to find out whether the same territory is added to someone else and Gaps would let you know the territories for which you still haven’t assigned the owner. From a day to day operation stand-point the system provides flexibility to define multiple metrics on territories like Number of Accounts, Closed Revenue, Market Potential, and Forecasted Revenue etc by “Time Period” dimension. On click of button “Show Analytics” you would get a detailed view of these metric figures along with interactive reports for each of the territory on the metrics that you have defined. The reports are good to cover various time periods as well as compare and contrast performance of one territory against another and multiple child territories under one parent. Now coming back to the role of Sales representative, the customer center is a single place to get the complete 360 degree view of the customer right from basic customer profile information to contacts, organization chart, interactions, tasks appointments, leads, opportunities, revenue lines etc. 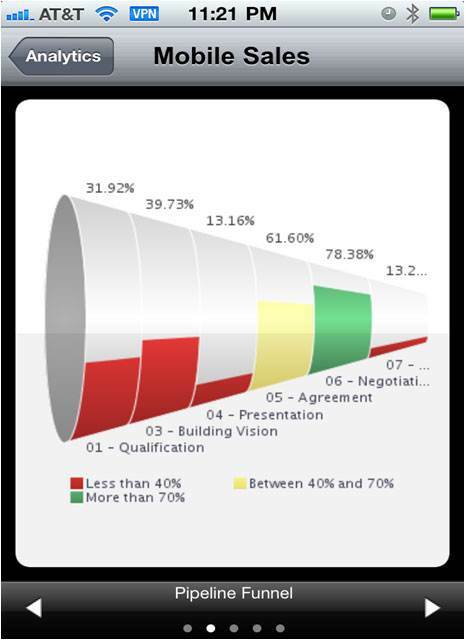 In addition to the above it provides an interactive assessment tool to assess the quality of leads using a well structured predefined questionnaire. 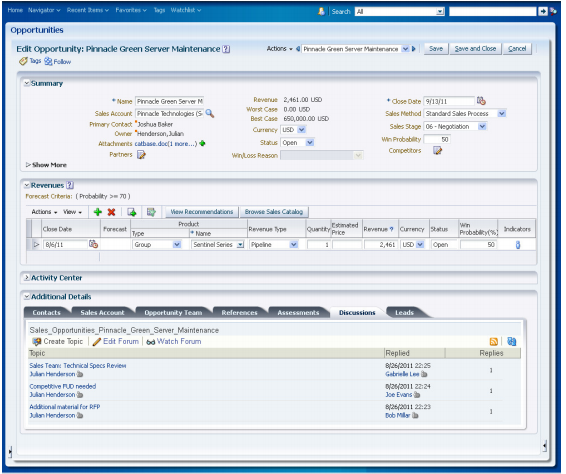 On Collaboration front, the system has an embedded “Discussion Thread” to collaborate on the account with Account Team members and Oracle Social Network for Social Styled Conversation on an opportunity or account. Similarly with sales representative’s limited bandwidth, the optimal outcome would come out only by working on most promising opportunities. 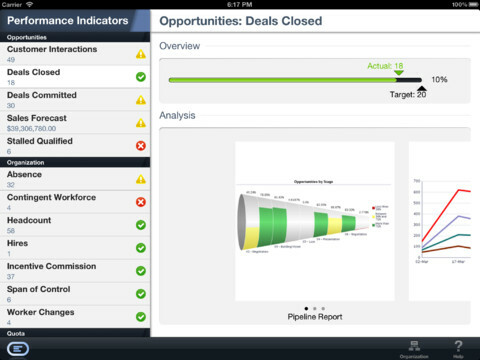 Fusion CRM Predictive Analysis Engine helps the sales representative to get answers for some fundamental questions like product that he should consider offering for a prospect / customer, kinds of customers buying certain type of products, potential revenue impact of the deal and the sales cycle time to close the deal etc. 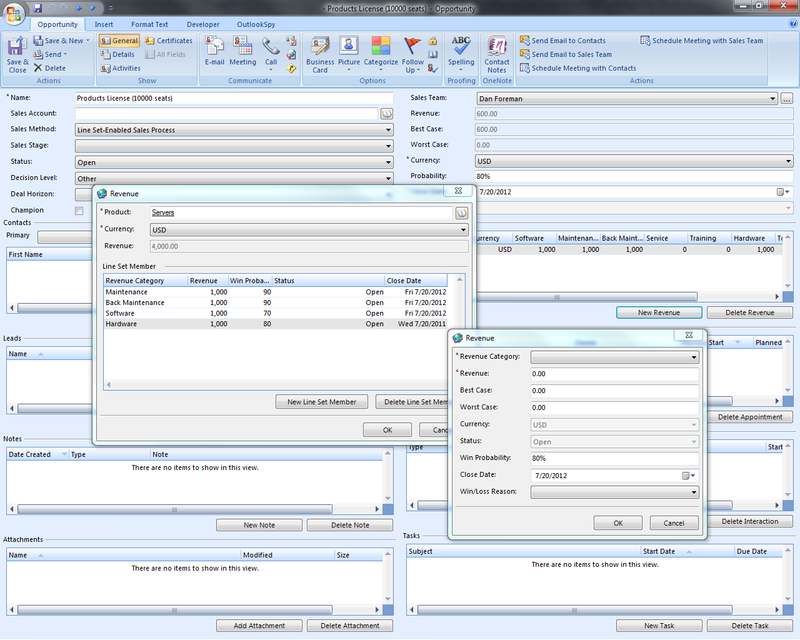 It does all the above by comparing Sales transaction history against the customer / account history. In addition to the above the release 7 of fusion CRM provides a Sleek Clutter Free interface as an optional interface via web to the users to perform the most common sales tasks without getting hindered with too many details. It is a so sleek that it can provide a consistent interface across multiple devices you can potentially use to access the application. For Tele-Marketing / Call Center users the application provides a Robust Telephony Interface framework that you can use to plug your back-end telephony systems to Fusion CRM. Once you are done with it, the system provides Click-To-Dial (Dial on click of a phone field) as well as Incoming Call Pop-Up on basis of caller information wherever application. In net if you look into the aspect of User Experience in a holistic manner beyond look & feel and application performance, I would say Fusion CRM is an application that is really designed for UX…. I was surprised, because to my knowledge that website doesn’t run any buses. They just allow you to book tickets from various bus service providers and that’s it. Personally, I have used this website many times, I know they don’t run any buses and hence I only book tickets from bus services which are highly rated by fellow users. As a result, I never had a bad experience. I would gladly recommend their website to anyone. But my colleague, had a totally different view on this. He said he will never book tickets from them anymore. Now, you can’t argue with this logic! Few days back, I had a similar experience when we tried to buy a washing machine for home. We went to a super market, looked at various models, and were debating on which one is best for our needs. My wife had some additional questions about few of those models, and asked the sales person. Unfortunately, that person was not able to answer any question my wife asked. It was clear that he didn’t understand anything about washing, forget machines. He is simply paid to stand there and tell people what models are available and how much they cost. My wife got really upset about this. ‘Let us go to some other store’, she decided abruptly. So, Consumers are not ready (or don’t want) to understand the gap between Sales and Delivery / Usage Experience. It is for companies to manage. They don’t care if you sell somebody Else’s product, they want the entire process to be smooth and you are responsible for it, end to end! When you look at the way most companies are organized, there is a Research division which looks at various customer needs and imagines products. Then we have a production division which makes these products, we have Sales / Marketing divisions which take care of the selling process and Support division to take care of customer issues. Each one of these divisions have their own problems / solutions and boundaries. Not anymore. A sales guy can’t say “My CRM ends when an opportunity is converted to an order”, a Service guy can’t say “No Purchase, No Support”, Whether we like it or not, we need to do everything possible to make sure that EVERY touch point a customer has with us, are giving them the best possible experience. For example, someone coming to your website, visiting your twitter page / facebook wall, buying your product in a small store, calling the telesupport number to report an issue, talking to their friends about how your product functions … all these touch points (and more) are important, and as a company you need to make sure all these experiences are great. This is not optional anymore, one bad experience in any of these touch points can drive tons of business away from you. Customer Experience Management, that’s where the future lies. CRM is not enough, it’s going to be CEM Era now! For example, let us say you are in Opportunities page and drilling down into a particular opportunity you are working on. As expectged, These details are displayed in Local Area. But look at what happens around this area. 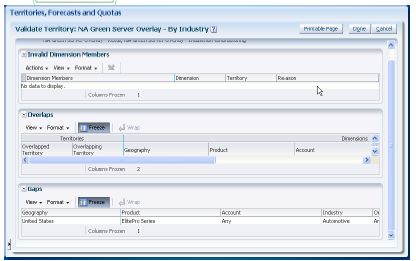 Observe that Regional Area displays tasks linked to opportunities, that can be triggered in one click. 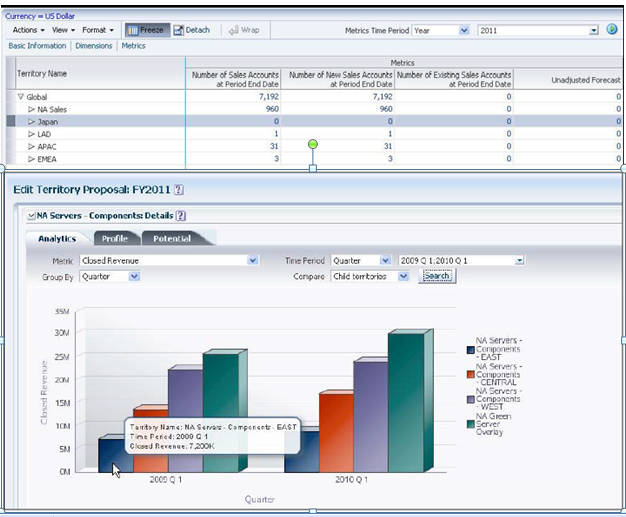 You don’t have to leave the opportunity focus area to perform a task and this is possible via the unique user experience of Oracle Fusion Apps. A related feature is Navigation. There is a dedicated Navigation option available on the Global Area (Similar to Menus in any desktop application) and on click of which you can look at all commonly accessed page, again with a single click. 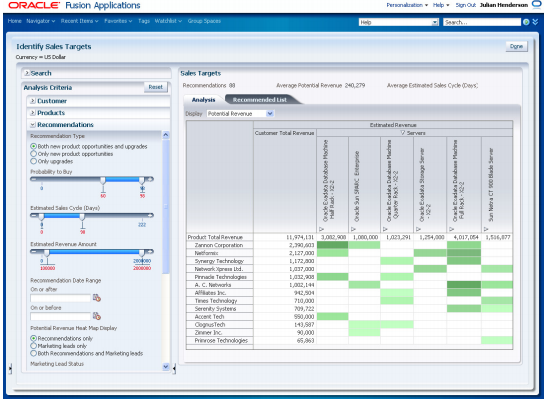 Oracle Fusion CRM is not only fast, but also smart! When one thinks about high-performance indicators within business verticals, two factors that always stand out are customer satisfaction and experience. Effectively answering all emails including service requests, complaints, grievances, appreciations and even requests for more business is critical to have a satisfied customer base. Likewise, promoting collaboration among CRM users and making it easy for them to work together with CRM On Demand via android phones is equally significant. 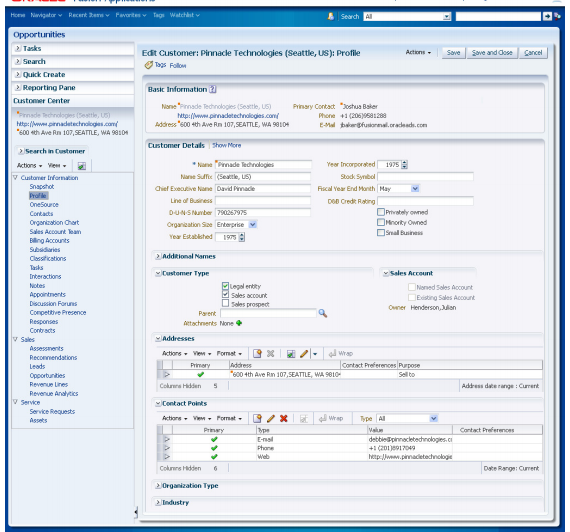 customer relationship management and data in a well organized and process centric way. but it also allows viewing and editing the information, as per requirement. opportunities for new and existing providers. irrespective of which individual is working on a particular problem. time is quick and tracking of issues becomes better.